THQ revealed in September that it had dropped Games for Windows Live in the upcoming Dawn of War 2: Retribution, but Vice President Danny Bilson says Microsoft is pushing hard to bring the publisher back to its beleaguered platform. In mid-September, THQ announced that it was joining Eidos and Bethesda in abandoning the sinking Games for Windows Live ship, opting instead to employ Steam in the upcoming Dawn of War 2 stand-alone expansion Retribution. It's no secret that PC gamers love Steam and loathe Live in close to equal measures and the switch is apparently working out pretty well for the development team too, but Bilson nonetheless suggested that the company could one day return to Microsoft's loving embrace. "It's been easier for development [moving to Steamworks], so far, but Microsoft is really talking to me a lot about getting back on Games for Windows Live," he told Shacknews. "So, it's not something I want to comment on because there are a lot of discussions going on about that right now. I like both platforms and I really, really, really like Microsoft as a partner. They're fantastic partners. I want to respect them." "There are a lot of discussions going on about that now because it's a sensitive issue," Bilson added. "The developers really like it, but again, I have incredible respect for Microsoft and they're really fantastic partners." You may recall that Microsoft recommitted itself to PC gaming in the summer and announced in October that the Games for Windows Marketplace would be relaunched this month as a web-based service. It's a long way from "fixing" GFW Live and, let's be honest, the Dawn of War franchise isn't exactly big-time blockbuster stuff, but at this point Microsoft has to do pretty much whatever it can to stop the bleeding. 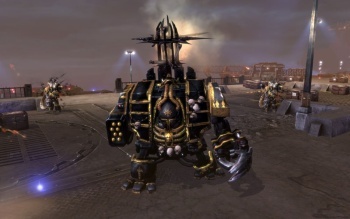 Warhammer 40,000: Dawn of War II - Reckoning is set for release in March 2011, exclusively for the PC.